The Irish Film Festival, Boston (BIFF) returned this year with its Directors Choice Screening Series on Friday, March 22, 2019 at the historic Somerville Theatre. ‘Float Like a Butterfly’ was honored with the festival’s 2019 Director’s Choice Feature award following its premiere screening at the Somerville Theater on Friday, March 22. Winner of the 2018 Film Critics award in Toronto, the film screened alongside ‘Late Afternoon’, the 2019 Animated Short Oscar-nominee, which also got its New England Premiere that night as well as the Director’s Choice Short Film. Over 700 attendees experienced two of Ireland’s most popular films, both female-directed, that touch on a variety of themes including empowerment and equality. The audience also had the opportunity to engage with Carmel Winters, director, and writer of ‘Float Like a Butterfly’, alongside lead actors, Hazel Doupe and Dara Devaney, as well as Toma McCullim, the film’s production designer, in a post-screening Q&A. ‘Float Like A Butterfly’, recipient of the International Federation of Film Critics (FIPRESCI) Prize for the Discovery Program at the 2018 Toronto Film Festival, is a powerful and timely story of a teenage Irish traveler, Frances’ (Doupe) fight for freedom and belonging. She lost her mother in a boxing fight; the same fight which landed her father (Devaney) in prison for the last ten years. Frances never forgave the police sergeant who she deems responsible for her father’s imprisonment, and when he’s released she aims to take on the world and box with her father. To her dismay, he urges her to give up boxing and act like a ‘lady’ now that he must remain obedient amongst the same policeman who sent him away. Frances refuses to listen and knows she must train and fight because winning will end the war. ‘Late Afternoon’, the 2019 Oscar-nominated animated short film directed by Louise Bagnall, tells the story of an elderly woman, Emily, who lives between two states; the past and the present. Throughout the 10-minute film, she goes on a journey into an inner world where she relives moments from her life and searches for a connection within her fragmented memories. The Irish Film Festival was also proud to co-present and support two additional Irish Films getting their theatrical release in Boston on March 23-24. ‘Maze’, the Irish Film Festival’s 2018 Director’s Choice Feature, a film based on the true story of the 1983 mass breakout of 38 IRA prisoners from the HMP Maze high-security prison. As Larry Marley, the chief architect of the escape schemes his way towards this feat, he meets prison warden, Gordon Close. What follows is an intense intriguing drama during which an unlikely relationship is forged between two adversaries. ‘Maze’ opened at the Somerville Theatre Saturday, March 23rd with Director Stephen Burke, Producer Jane Doolan and actor Tom Vaughan Lawlor in attendance for Q&A’s while ‘Lost and Found’, a quirky, comedic feature film with multiple interconnecting stories set in and around a lost and found office in an Irish train station, opened at the Kendall Theatre Friday, March 22nd with a co-presentation with IFF, Boston and Landmark Theatres on March 24th with writer/director/actor Liam O’Mochain present for the Q&A. 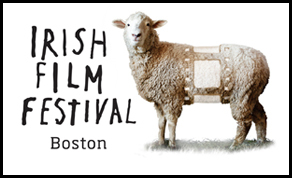 Click here for more information about the Irish Film Festival Boston and the Director’s Choice Screenings. Irish Film Festival.